Is It OK to Bring a Baby to a Bar or Restaurant in Philly? An Italian restaurant in Rome recently made international news for banning children under five. Citing bad manners and general unpleasantness, the chef announced the ban on Twitter. It’s the latest in a long line of eateries across the globe that have taken a stand against the rattle and pacifier set. Whether you cheered or booed the decision, bringing children into bars and restaurants is a divisive issue, especially in a city like Philly where there are plenty of young parents who still want to drink and eat well. Popular guides and rants about bringing babies to bars have tried to bring levity to the situation even though a lot of parents aren’t laughing. This should I/shouldn't I question touches on community spaces and who has the right to enjoy them. Do children belong in adults-only spaces? A lot of people say hell no. Babies can be loud, messy, and unpredictable. But even the perfect child can cause waves by merely existing. Some say babies remind them of the boring trappings of responsibility in places they go to escape the pressures of the real world. Everyone’s looking for an escape, but whose escape fantasy -- parents or baby-free patrons -- should take precedent? Even the perfect child can cause waves by merely existing. 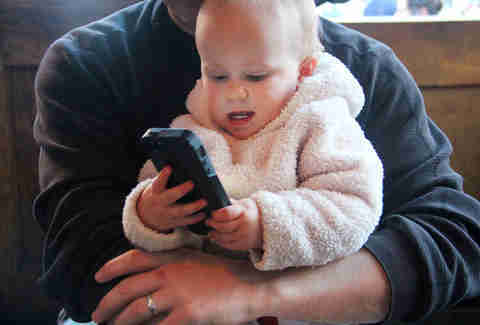 Are children in dining and drinking establishments the human equivalent of checking your cell phone in a movie theater? Or are they tiny patrons, free to be anywhere as long as they behave? If it seems like parents are being ganged up on, well, they are. Restaurant owners wring their hands over the liability rowdy children bring. We’ve all seen a rogue toddler scurry underneath a waiter’s feet or hurl a salt shaker across the room. Many chefs don’t want to alter their dishes for younger, pickier palates -- not every place can serve chicken fingers and french fries. Of course, some patrons see screeching children as a rude buzzkill, too. Most parents defend themselves by saying they just want a nice meal and to expose their children to something other than Chuck E. Cheese’s obnoxious neon existence. They’re happy to take their little ones to their neighborhood bar. They sip their chardonnay or nurse their lager while their kid fiddles with a smartphone. Where’s the harm in that? 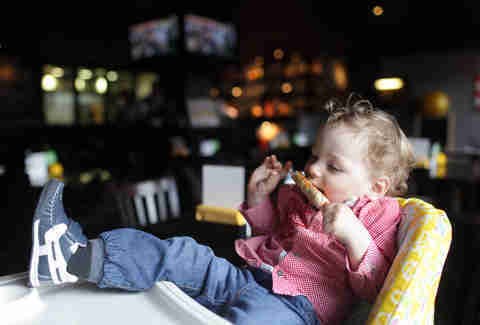 Some Philly bars have embraced the trend of bringing babies to bars. Bella Vista’s Coeur rolled out a mommy juice happy hour, a cheeky move to capitalize on the sticky intersection of parents, bars, and children. It’s been met with mixed reactions: parents are happy to have space carved out for them, while the childless feel alienated by the move. 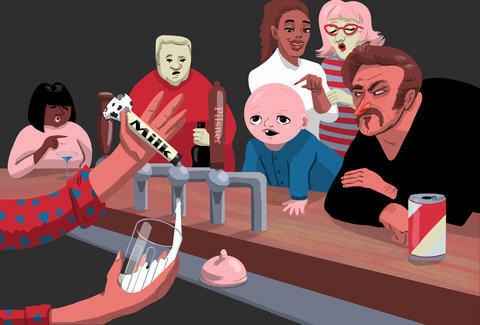 It’s pretty much the entire “babies in bars” debate rolled into one happy hour. Writer/comedian Nikki Walter doesn’t mince words: “Even if it's not their fault, babies are living, breathing party fouls.” As an Eraserhood resident, the last thing she wants to see or hear when she’s unwinding with her friends is an irritable child. Cheri Willner, owner of Washington Square West’s Knead Bagels and a parent to a toddler, is sensitive to these common complaints; she’s heard ‘em all. She agrees with Walter that time of day and proper judgment are essential to dining out and has developed strategies to ensure a happy outing for her family in their Bella Vista neighborhood. “I would never take my kid to a fine dining restaurant, somewhere that served more than two or three courses, or had a dress code." And for parents like Willner, it’s never been easier to gauge where’s a great place to take her kid. She’s plugged into a robust network of like-minded parents who want to partake in Philly’s thriving restaurant scene. Email listservs and secret Facebook groups share their experiences out on the town. She gives props to Bing Bing, Whetstone Tavern, and Santucci’s for making it easy for families like hers. “Bing Bing is awesome. They have a kids’ noodle dish, kid chopsticks, highchairs, and coloring books. It’s wonderful.” With so many ways to share information, parents can be more nimble as they navigate the dining scene. She also credits Yelp as a valuable resource -- it has a 'Good for kids' category in businesses' info sections. Anna Goldfarb is author of the humor memoir, Clearly, I Didn’t Think This Through, and believes if babies can go to bars, adults should spend more time napping and eating snacks. It's only fair. You can follow her: @MsAnnaGoldfarb.